Revising and restructuring a manuscript is generally done sitting behind the computer screen using Microsoft Word’s handy editing tool, ‘track changes’, and drawing on over 20 years of experience in book publishing. 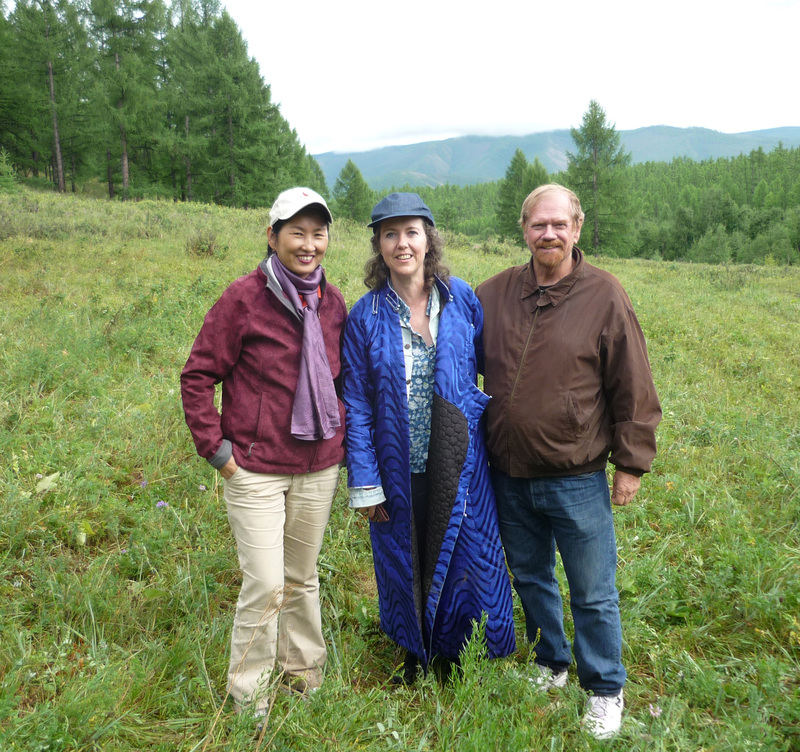 So when I was emailed by the late Ariane Fasquelle in Paris, on 2 July, 2014, I had no idea that I would end up going on the ultimate road trip a year later, taking in the wilds of northern Outer Mongolia with the authors of The Green-Eyed Lama, and their entourage. Editing with Oyuna and Jeff kicked off 10 months after Ariane’s first email. To ‘translate’ a culture, way of life and overlooked chapter of history for Western readers; offset universal themes and similarities of the human condition against local detail and differences; and ensure the book reads like a good work of historical fiction, is a fine balancing act. I’d revise 3 or 4 chapters and email them to the authors, who’d make comments and revisions in turn. We had face-to-face sessions once a week via Skype. A constructive relationship blossomed along with their novel, so we agreed that a visit would be a perfect finale. 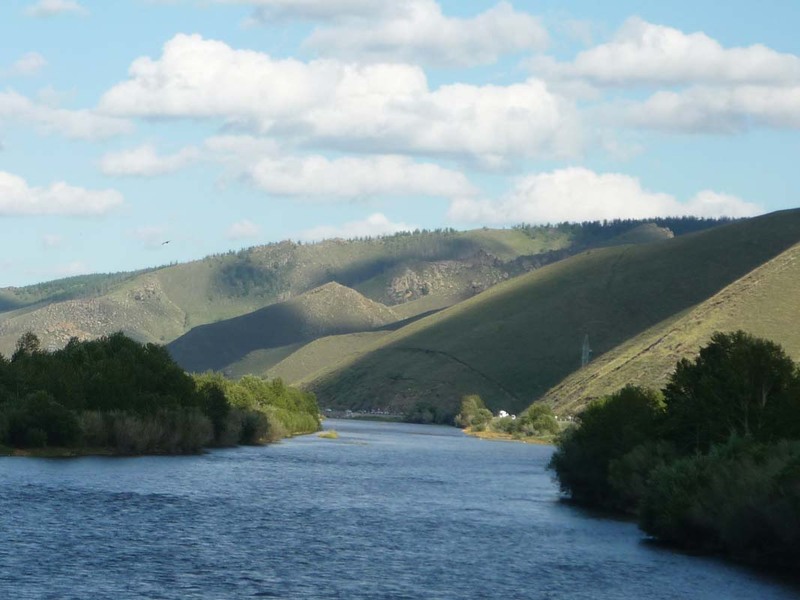 To get a feel for the land of Chinggis Khan, see some of the few remaining Buddhist temples, savour the northern steppes, and meet Oyuna’s relatives descended from the herder families in her novel would give added detail and depth to the final draft due for delivery to Grasset & Fasquelle in Paris. Ariane was arranging for the book to be translated into French, for publication in 2017. The first 25 years of democracy were being celebrated when I was in Mongolia. It certainly made a positive change to hear about a successful ‘massacre-free’ revolution! 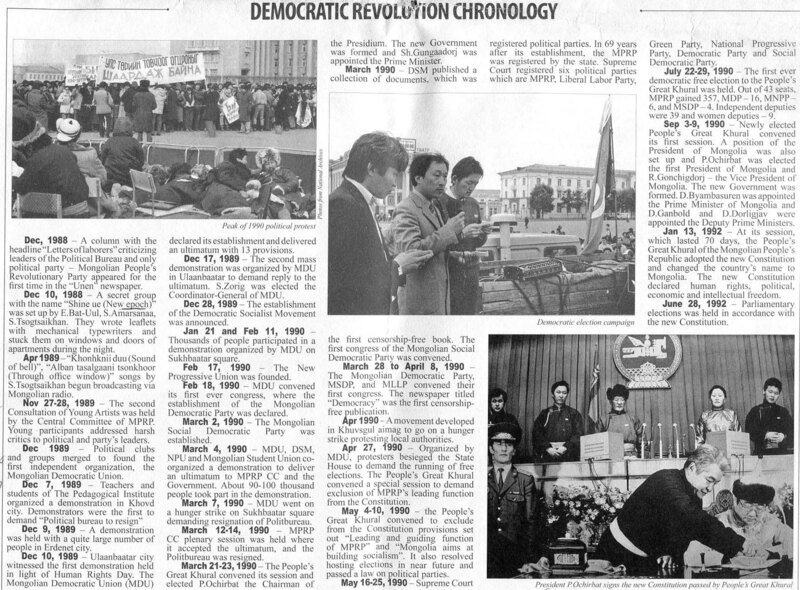 The pro-democratic movements of 1989 coalesced into forming the Mongolian Democratic Union. Having endured decades of one-party rule, Mongolians were sick of being part of the Socialist Block led by the Soviet Union. They wanted sovereignty, (which had a familiar ring to it). Protests for social reform, democracy and human rights led to the first ever free democratic election being held in July 1990. It heralded the end of The Mongolian People’s Republic in existence since 1924, and the irreversible transition to democracy and a market economy. Oyungerel Tsedevdamba is an impressive woman and wears her well-earned success lightly, and with much charm. A Member of Parliament of Mongolia, she has served as the Minister of Culture, Sports and Tourism; as president of the Democratic Women’s Union of Mongolia; and non-staff advisor to Mongolian President Elbegdorj Tsakhia. Her husband, Jeff Falt, “had a Tom Sawyer childhood hiking and horseback riding in the hills above my home town of San Carlos, California,” as he likes to put it, before getting a B.A. (history) J.D and M.A. (Asian Studies) at U.C Berkeley. As a human rights lawyer he has worked as a Regional Program Officer for Law and Human Rights at the Asia Foundation; consulted with numerous projects in Africa, Asia and Latin America − particularly in conflict and post-conflict situations chiefly with disenfranchised groups; and has observed elections in Cambodia, Liberia and Sri Lanka. Their co-authored novel, The Green-Eyed Lama, depicts the power struggle between the communists and the nomadic herders and Buddhist clergy in the 1930’s and 1940’s. 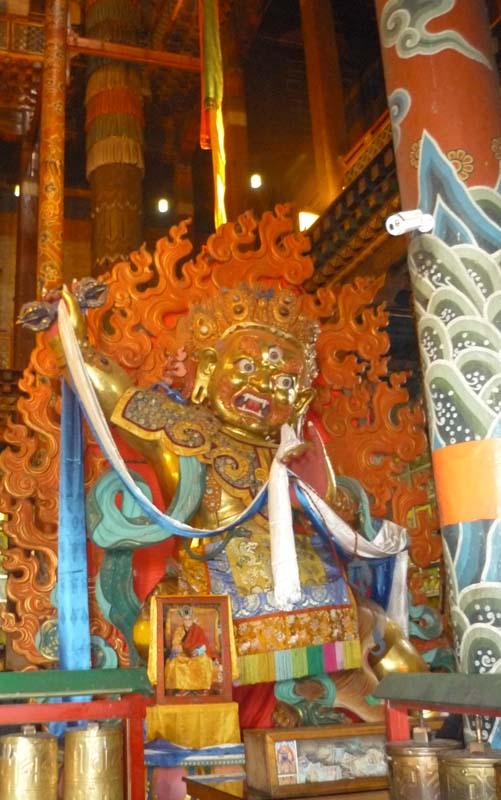 Very few people in West know about the genocide of the lamas (monks) and destruction of Mongolia’s religious temples. Khorloogiin Choibalsan’s religious purges destroyed a centuries-old nomadic way of life and Buddhist society. 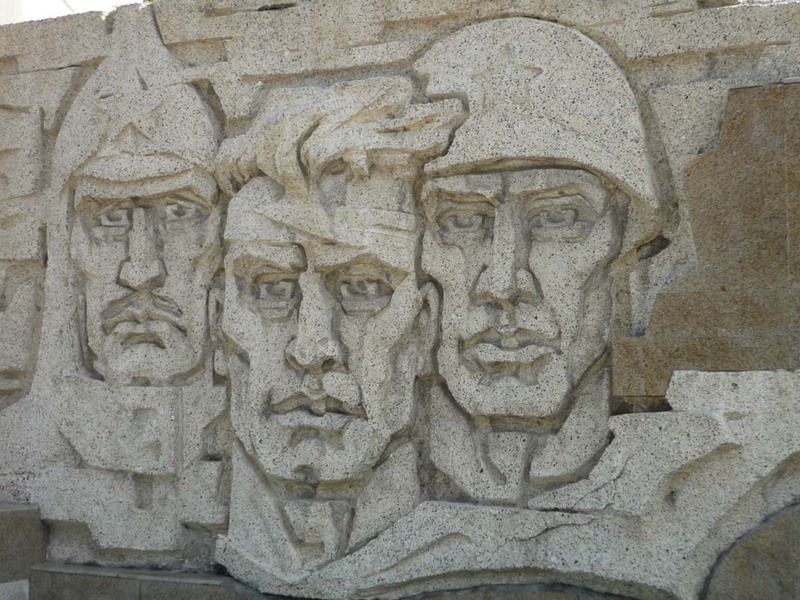 Members of the Buryat and Kazak ethnic groups who had fled the Soviet Union’s Red revolution were also targeted. This period forms the setting for a great story of unrequited love between Lama Baasan and Sendmaa, who was Oyuna’s grandmother. Who better than Oyuna to organise the ultimate road trip? It was a toss up between Turkish Air, Aeroflot and Air China. I opted for the latter, with a 17-hour stopover in Beijing. The hotel was booked courtesy of the airline at no cost to me. companies in Oyu Tolgoi, in the Gobi Desert, is expected to account for one-third of Mongolia’s GDP by 2020. The world’s largest untapped coal deposit, in Tavan Tolgoi, is attracting the interest of companies based in the U.S., Switzerland, Luxembourg, China, South Korea, Japan, Russia and Brazil. 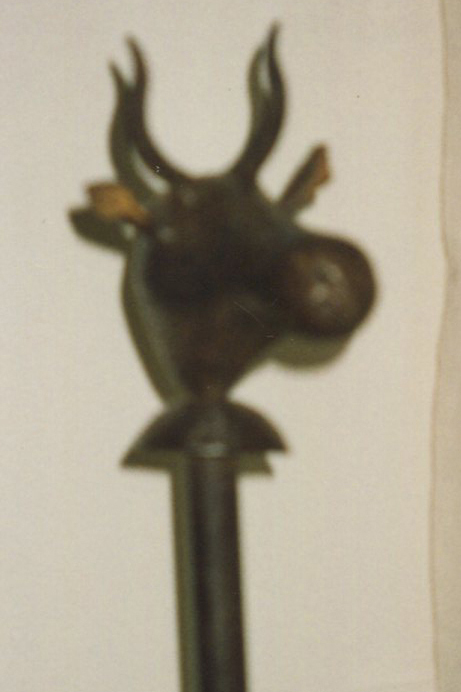 Herders often leave the lands of their ancestors to work in the mines. About 30% of the population live below the poverty line. 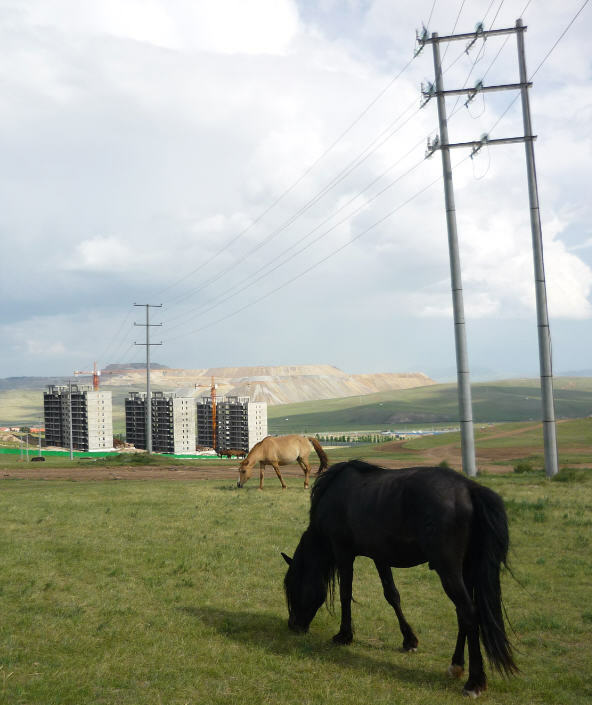 Grassroots Human Rights advocates are working hard to promote sustainable development to ensure that Mongolia’s mining boom does not destroy ecosystems and the lives of nomadic herders. Arriving in UB, I was whisked to the theatre to see some spectacular music and dance courtesy of The Mongolian National Song and Dance Academic Ensemble; followed by dumplings and bed. 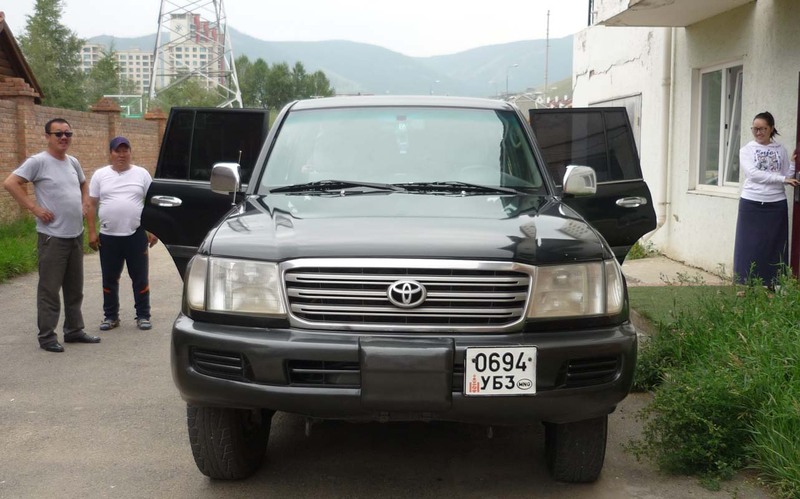 We would leave early in the morning and head north west towards the Russian border, to Erdenet − which has the fourth largest copper mine in the world − and enjoy lunch with the local Governor, a former school friend of Oyuna’s. In the 1990s, 90% of the Mongolian government’s budget came from Erdenet; now it’s about 40%. The Erdenet Mining Corporation is a joint Mongolian-Russian venture. Tony Blair has a company based there which advises people on mining in Mongolia. So much for striking gold in mineral-rich Central Asia! I was introduced to Sue Byrne, a passionate advocate for Buddhist traditions in Mongolia, at the birthday party and book launch for the late Anthony Aris held in March 2015. She recommended Buddhism in Mongolian History, Culture and Society edited by Vesna Wallace, (OUP, 2015) and Christopher Kaplonski’s The Lama Question: Violence, Sovereignty, and Exception in Early Socialist Mongolia, (University of Hawai’i Press, 2014).